If this Spring weather has suddenly given you a case of wanderlust, it might be time for a quick getaway. 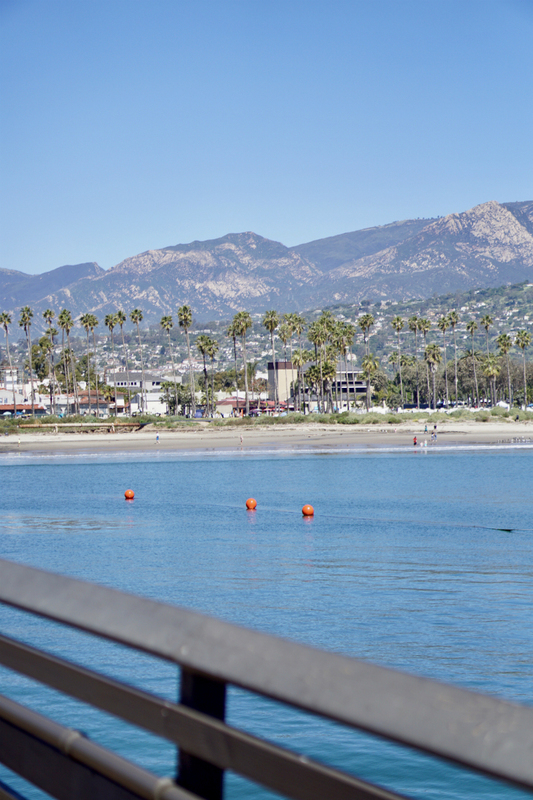 From beautiful beaches to iconic landmarks and hopping eateries, there’s no shortage of fun things to do and incredible places to visit in Santa Barbara. If you don’t want to spend a fortune on your Southern California vacation, no problem! There are lots of budget-friendly spots to enjoy. Read on to discover some of the best places to stay and play in the American Riviera. While we often stay at luxury resorts, we decided to opt for a more budget-friendly vacation this time (especially since tax season is upon us). 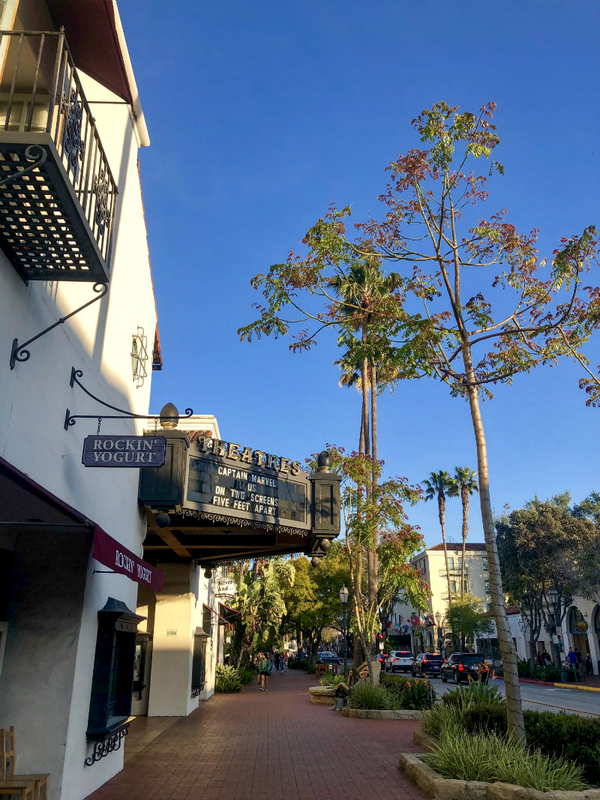 So, if you’re curious about how to spend 24 hours in Santa Barbara for under $350, read on to learn about the must-visit places in this enchanting coastal town. Plus, if you’re traveling with your dog, then you’ll be happy to know that your furry friend can accompany you to the places listed in this travel guide. 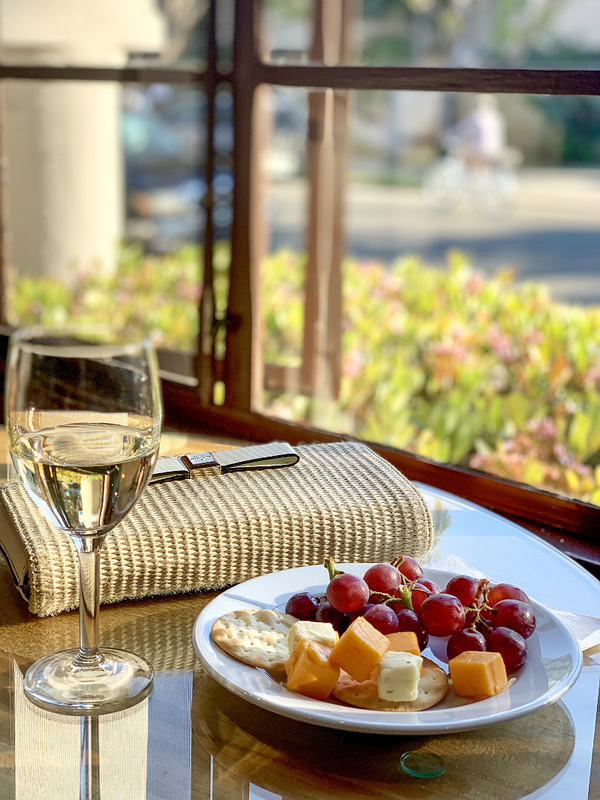 As we searched for dog-friendly hotels in Santa Barbara (priced around $200 per night), we discovered a gem of a property known as the Casa Del Mar Inn. 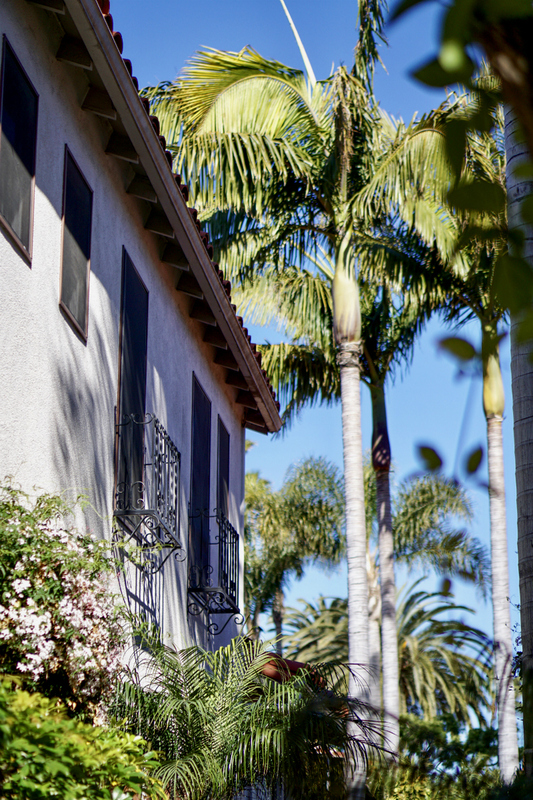 Located 1-block away from the beach and a short 15-minute walk to downtown Santa Barbara, this charming B&B offers the quintessential beach vacation experience. 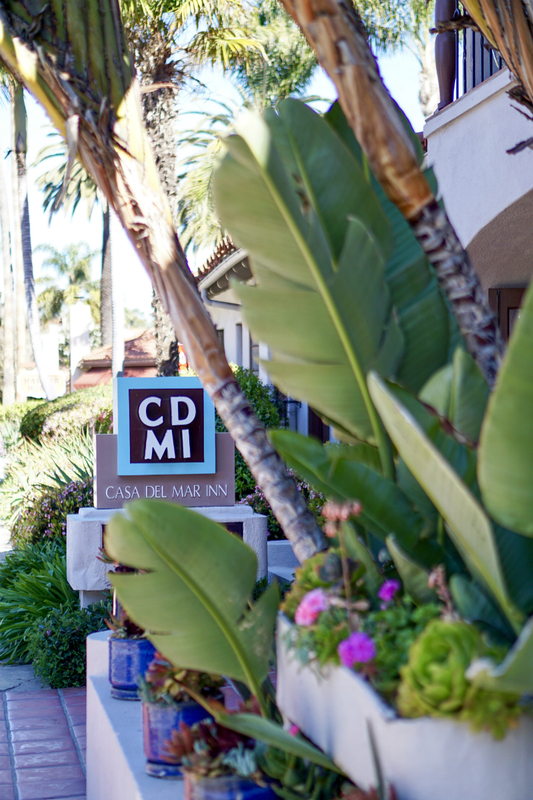 In addition to providing relaxing accommodations (in their modern-meets-coastal rooms and traditional Mediterranean-style architecture), CDMI also offers guests a complimentary wine & cheese happy hour each evening, as well as a decadent continental breakfast (included) each morning. 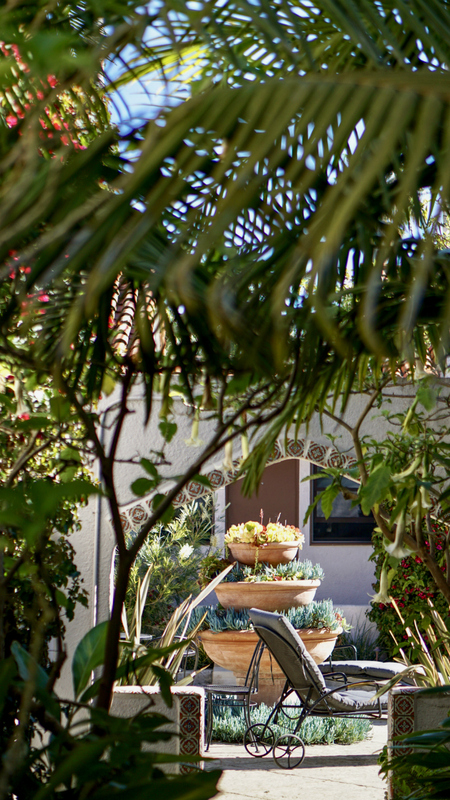 Surrounded by lush gardens and swaying palm trees, this picturesque inn is both cozy and comfortable. Plus, the convenience of its prime location made it a wonderful place to stay (since we could just park the car and walk to a number of must-visit places). When we first arrived in Santa Barbara, we headed over to the bustling Whole Foods Market to pick-up lunch (which cost us less than $20). 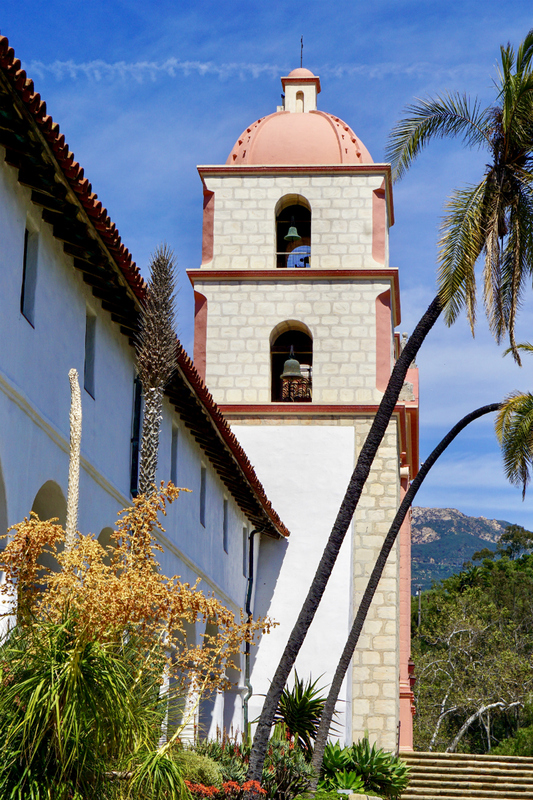 After that, we went to visit the renowned Santa Barbara Mission – which is truly one of the must-see places in Santa Barbara. This spectacular landmark is an inspiring place to visit, whether you’re Catholic or not. With sweeping views of the Pacific Ocean and tropical gardens surrounding the property, it’s an idyllic place to have a picnic lunch and tour. Plus, it’s a great spot for photo-taking, since it has 360-degree views including views of the Santa Ynez mountains in the distance. After spending some time at the Mission, we decided to head to downtown Santa Barbara to walk along State Street. From bustling restaurants, wine tasting rooms and bars to boutique shopping, there’s no shortage of places to see and things to do downtown. 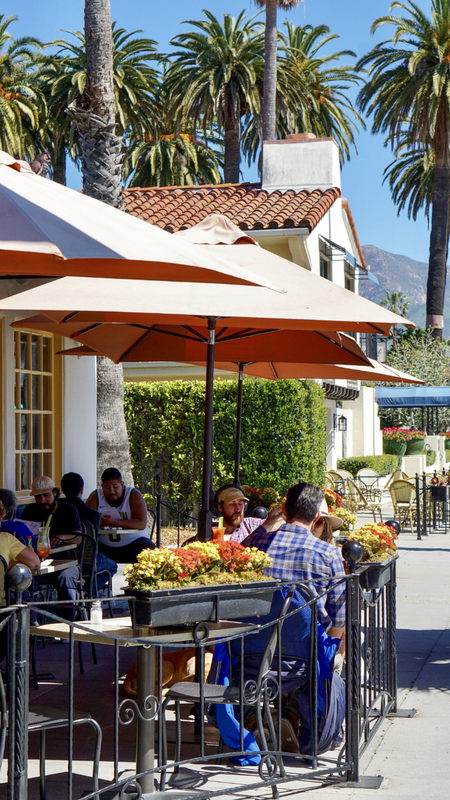 Plus, since Santa Barbara is a college town, it’s hopping with lively activity and a lot of fun people-watching. 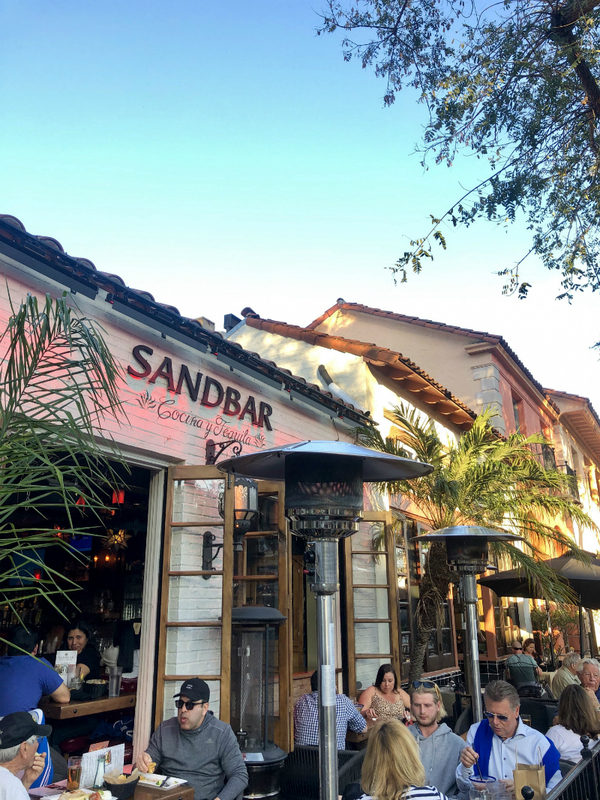 Since we wanted to eat outdoors with our pet (as the weather in Santa Barbara is ideal for al fresco dining), we came across a lively indoor/outdoor restaurant and bar on State Street called Sandbar Cocina y Tequila. This Mexican restaurant is a popular destination for both locals and tourists, as it’s a great place to see-and-be-seen. Plus, the food is outstanding and surprisingly fair-priced. Not to mention – the vibrant Spanish decór and colorful atmosphere make it a fun place to dine. Boasting a full menu during the daytime, this hip eatery turns into a cool late night scene (complete with live music, dancing, and cocktails) when the sun goes down. 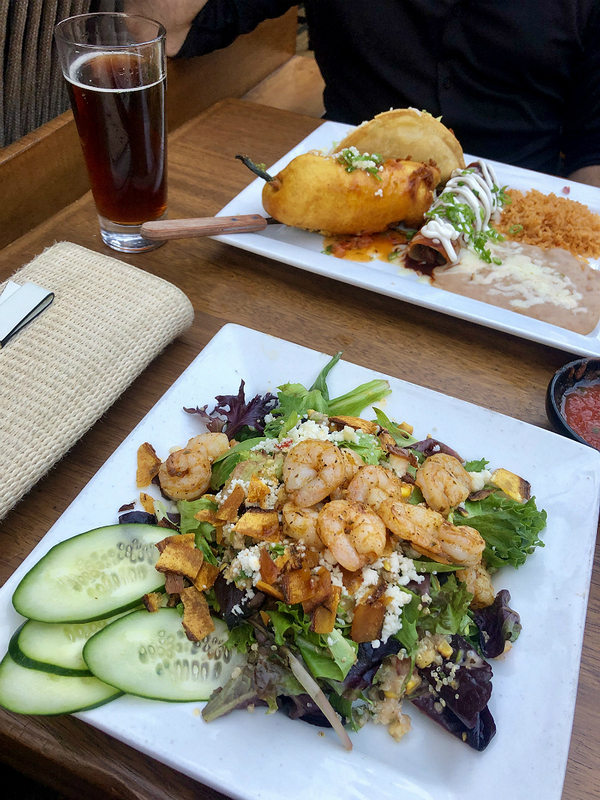 From multiple televisions broadcasting live sporting events (like March Madness) to piped-in music and a mouth-watering menu complete with everything from fajitas to specialty salads, it’s no wonder this place is so popular. Did we mention that Sandbar has been named to the “Top 100” by Nightclub & Bar Magazine for the last 4 consecutive years? For just $60, we ate and drank our way to happiness that evening. After enjoying the continental breakfast at CDMI the next morning (which included an assortment of coffee and juice, cereals and oatmeal, pastries and bagels), we ventured off by-foot to explore the surrounding neighborhood. We started by heading down toward the recreational trail along the beach. 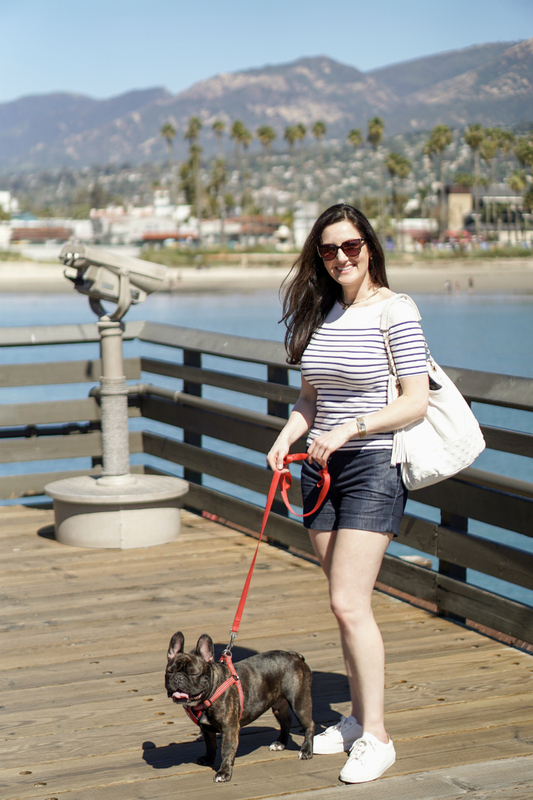 Within a brief 10-minute walk we found ourselves at Stearns Wharf – one of the most popular tourist destinations in Santa Barbara. 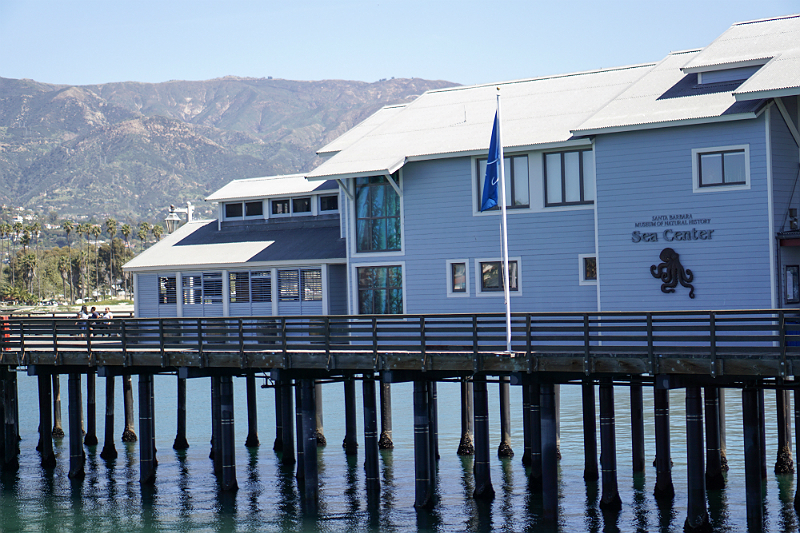 The wharf is a great place to visit in Santa Barbara as it offers a number of waterfront eateries, shopping, wine tasting, and even recreational activities (such as kayaking and boating). 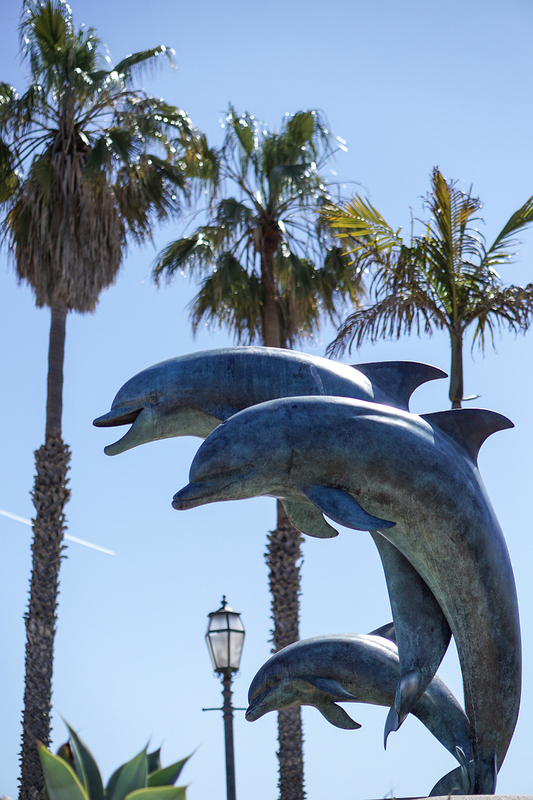 Not to mention – it’s home to the Santa Barbara Museum of Natural History Sea Center, which gives you an up-close view of sea life. 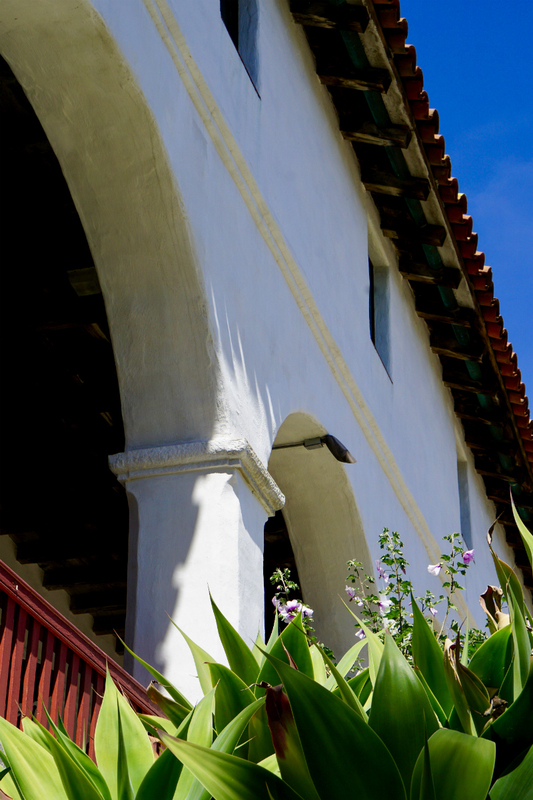 Plus, it’s one of the best places to take photos and enjoy the natural beauty of Santa Barbara’s renowned coastline. After walking around the wharf and beach, we worked up an appetite. 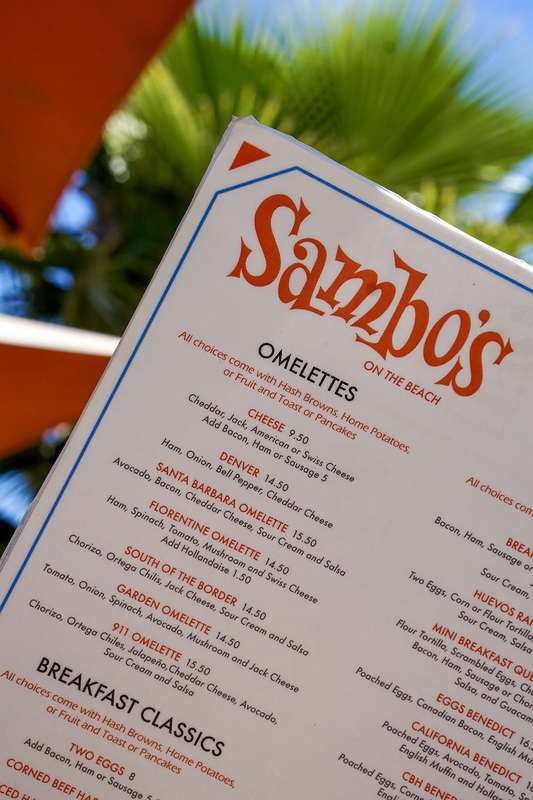 As we were walking back toward the inn, we discovered Sambo’s Restaurant, which is a popular indoor/outdoor cafe with views of the ocean. Offering a robust breakfast and lunch menu (that’s budget-friendly and includes a variety of tasty dishes), this hopping eatery was the perfect place to stop for a late (and filling) brunch, which cost us less than $40. 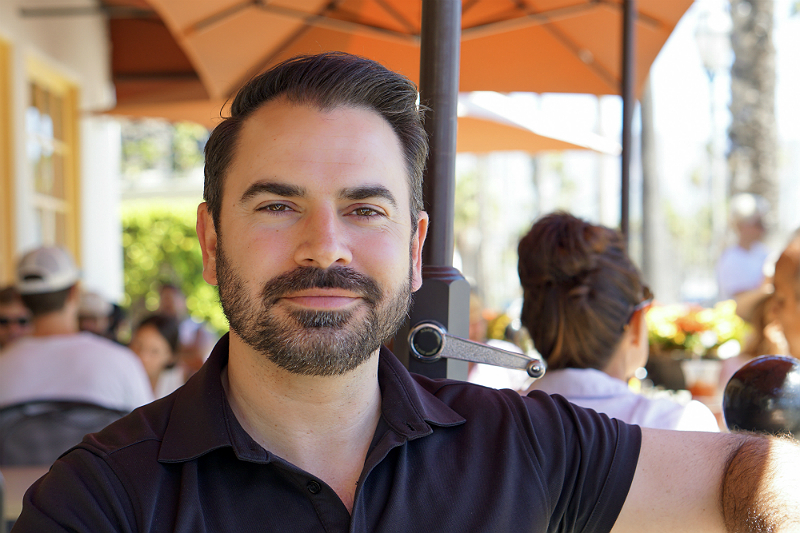 A few of the most popular brunch dishes that they offer include Eggs Benedict, Omelettes, and Breakfast Burritos. The portion sizes are generous, so you can expect to take food-to-go if you aren’t overly hungry. Plus, the outdoor patio has colorful umbrellas (to shade you from the sun), and is located in the perfect place for lively people-watching, since it’s across the street from the beach and rec trail. As you can see, visiting Santa Barbara for a quick trip doesn’t have to cost a fortune. From fun restaurants and bars to incredible sight-seeing, there are so many things to do and places to visit in this spectacular destination town. To discover other great places to stay and play in Santa Barbara, check out our other Santa Barbara Travel Guides including the “The Ultimate Luxury Travel Guide to Santa Barbara” and the “Fun Family-Friendly Travel Guide to Santa Barbara”. For more vacation ideas and travel tips, visit the Travel section on Inspirations & Celebrations.